RandomPottins: No Invitation to the 'Butcher of Gujarat'! No Invitation to the 'Butcher of Gujarat'! AYES (FAR) RIGHT? Narendra Modi could use Commons visit to boost his campaign to become prime minister of India. RIGHT-wing Indian politician Narendra Modi, whom many people hold responsible for riots in which 2,000 people were killed, has been invited to Britain, and a Labour MP has made the invitation. Modi, Chief Minister of the Indian state of Gujarat, is expected to run for prime minister of India next year on behalf of the right-wing Bharatiya Janata Party(BJP), and opponents fear a British visit will be used to boost his prestige and the party's fundraising. A Modi campaign would favour big business while spelling hostility to India's minorities and neighbouring countries. Modi first became Chief Minister in the western state of Gujarat in 2001, and within a year an attack by Muslims on a train carrying Hindu pilgrims from a controversial site became the pretext for riots which many describe as government-organised pogroms, prepared beforehand. Muslim homes and shops were attacked, and as many as 2,000 people, including children, may have been killed. Women and young girls were subjected to some of the worst violence. Some 250 were gang raped and killed, their bodies being thrown on bonfires. Some children were burned alive. The High Commission gave as his opinion that "reconciliation between Hindus and Muslims is impossible while the chief minister [Narendra Modi] remains in power'. A Special Investigation Team appointed by India's Supreme Court cleared Modi of complicity last year, but Muslims reacted with anger and disbelief, and human rights organisations say evidence was suppressed. 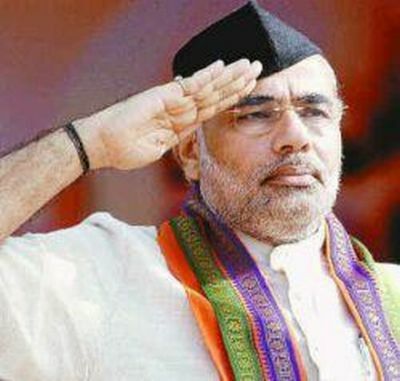 Modi is a lifelong member of the Rashtriya Swayamsevak Sangh (RSS),which drew much of its inspiration from European fascism, describes himself as a "Hindu nationalist", and remains unrelenting in his hate-mongering. In 2005 the United States decided to refuse Modi a visa because of his record, and in 2009 an invitation to him to address a prestigious business conference in London was cancelled. But this time, with the US, EU and British business seeking advantages, the invitation to Modi comes from Labour Friends of India chairman Barry Gardiner, MP for Brent North. He has been joined by the Conservative Friends of India in inviting Modi to address MPs in the Commons on "The Future of Modern India". “The invitation is a culmination of several years of engagement between senior representatives of the Labour Party and Narendra Modi,” the MP for Brent North said. If that is true then a lot of people, and not least Labour Party members and supporters, might want to know more about it. Meantime the focus is on Barry Gardiner. The Brent North MP has a large number of Hindus among other people in his constituency, and some may be supporters of the BJP. His Tory predecessor in the seat Rhodes Boyson once chaired a meeting with Menachem Begin. But it is not a precedent to be followed, let alone exceeded (Begin was already Israeli PM and the guest of the British government by then). Cultivating good relations with communities is one thing, assisting right-wing parties and leaders to exploit them as base, and build bridges to government, is another. Several people and organisations, including Brent Trades Union Council, are writing to Barry Gardiner expressing concern over the Modi connection, and an online petition against the visit has gathered more than 7.000 signatures. The South Asia Solidarity Group is inviting people to join a protest at the MPs surgery on September 9. Join the protest, No Invitation to the Butcher of Gujarat! MONDAY September 9, 11.30am to 1pm, at Brent Civic Centre, Engineers Way. Wembley, HA9 OFJ (nearest tube Wembley Park). Brent council urged to "Bin Veolia!"